Harold Park Hotel 70A Ross Street, Glebe, , NSW, Australia. Join Becky Lucas, Sarah Gaul, Jack Gow, Mantaur, Cyrus Bezyan and Madeleine Culp for a great night out at The Harold Park Hotel. 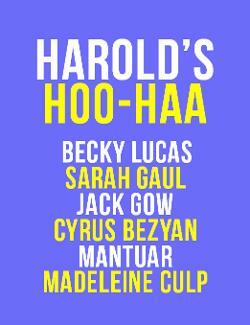 Hosted by Jen Carnovale and with magic by Harrison Milas, don't miss Harold's Hoo-Haa! Ticket sales for this event will go to support our stellar comic line up and New Ghosts Theatre Company's upcoming production YEN. Can't attend Harold's Hoo-Haa but still want to support New Ghosts' production of YEN? You can purchase a DONATION TICKET here which includes entries to our incredible raffle. Donation tickets will assist New Ghosts with the purchase of set, costumes and props. We hope to have your support!